Are you looking for a reliable way to protect your mattress from spills and other mishaps? If so, then a mattress pad could be just what you need. 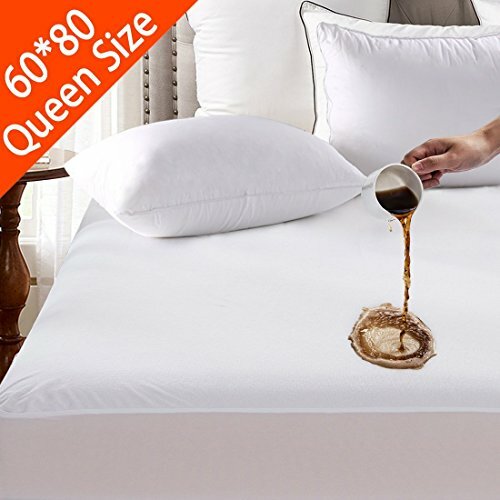 Our top pick for the best mattress pad on the market today is the Tastelife Waterproof Mattress Pad, as it provides protection against spills and won’t bunch up or overheat. Our second favorite is the Sable Mattress Pad, as it comes with three layers for extra protection. A mattress pad, also called a mattress protector, is a useful product for protecting your mattress from messes that can happen with pets or kids. In addition, they’re a good way to potentially extend the life of your bed. These products come in all sizes, just like mattresses, and can be used solely as protection or to add a small amount of additional comfort to your bed. 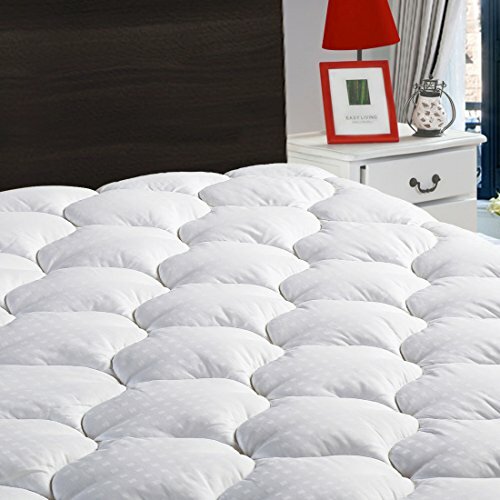 In this article, we’ll cover the 8 best mattress pads available on the market, followed by more information about how they work and frequently asked questions about using one. The Tastelife Waterproof Mattress Pad is an anti-bacterial, water-resistant pad with a breathable design so you won’t overheat while you sleep. If you’re sensitive to allergens, the mattress pad can provide some protection against mildew, mold, and common pests like dust mites. It is also soft and silent, so it won’t make annoying crinkling sounds when you or your partner move around in bed. This pad can be washed in the machine and tumble dried, but you shouldn’t dry clean or iron it. It’s made from an 80 percent cotton/20 percent polyester blend and comes with a 10-year warranty. The LEISURE TOWN Mattress Pad has a quilted design and is made with a 100 percent cotton cover. It comes vacuum packed and should be washed and dried before use. When you first unpackage it, give it some time to expand to its full size. This pad protects your bed without retaining heat, helping you stay at a comfortable sleep temperature while you rest. 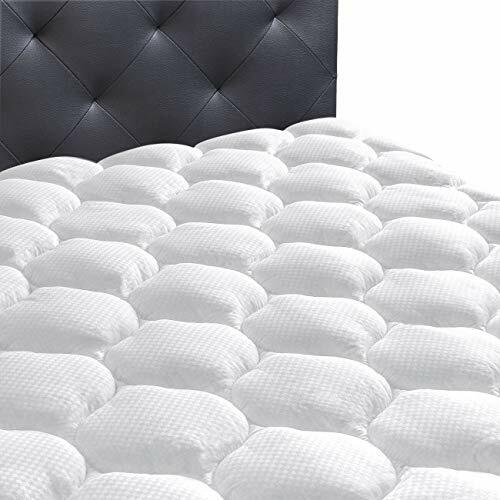 Its quilted design gives the LEISURE TOWN Mattress Pad a plush, comfortable feel and it’s made with down alternative filling. Note that this pad is only somewhat water-resistant and can protect your mattress from up to 200 ml of water. If you do spill on it, make sure you wipe it up quickly. The LEISURE TOWN Mattress Pad is easy to wash in the washing machine and comes with a money-back guarantee. The Hanna Kay Hypoallergenic Quilted Pad is made with high-quality hypoallergenic materials for people who are sensitive to allergens. It is made with a poly-cotton blend and has a breathable design to help you stay cool as you sleep. Unlike other mattress pads, it will stay put on your bed instead of bunching up. If you want protection for your mattress, along with some additional padding, the Hanna Kay Hypoallergenic Quilted Pad could be a good choice for you. For your peace of mind, it comes with a satisfaction guarantee that allows you to return the pad for your money back, no questions asked. The Sable Mattress Pad Protector is made with 100 percent polyester microfiber and protects your bed against dust mites and bacteria. This pad comes with three layers for protection and comfort and has diamond stitching to prevent bunching and keep the material evenly distributed. The Sable Mattress Pad Protector comes with slip-free elastic straps that make it easy to put on your bed, although some users report that it may require readjustment every so often. This pad can be machine washed but shouldn’t be ironed or bleached. It comes with a 30-day money back guarantee and a lifetime warranty that protects it against manufacturing defects. 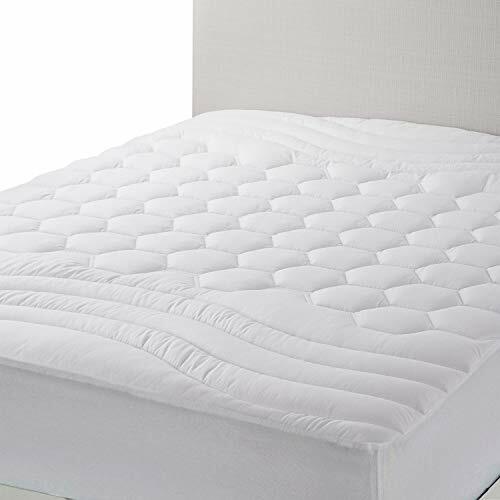 The Ecomozz Mattress Pad has a cotton cover and is filled with a down alternative material. It may be a good option for people who have a very firm mattress and want a little extra padding. Note that this mattress pad comes vacuum sealed and will need a few days to expand to its full size. The Ecomozz Mattress Pad is hypoallergenic and it also protects your bed from pet dander, sweat, and other fluids. It can be machine washed with gentle detergent and dried on a clothesline or tumble dryer. The Ecomozz Mattress Pad comes with a money-back guarantee in case you aren’t satisfied with your purchase. The Utopia Bedding Premium Mattress Pad is a comfortable, cushy pad with a hypoallergenic filling. It has a brushed microfiber design that encourages breathability to help you rest at a comfortable temperature. You can wash it in the washing machine with a small amount of mild detergent. Note that you shouldn’t dry it at a high temperature, as this can stretch or shrink the fabric. Make sure the pad is dry before you put it back on the mattress. The elastic on the Utopia Bedding Premium Mattress Pad makes it easy to pull over your mattress base. Note that warranty information isn’t given on Amazon for this product, but that you can contact the seller directly to find out more about it. The oaskys Mattress Cotton Top Mattress Pad is a hypoallergenic mattress cover that will protect against dust mites and other allergens. It has a soft feel and comes vacuum sealed, so you’ll need to give it a few days to expand to its full size before you use it. 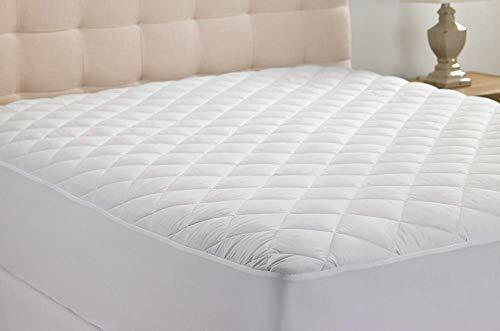 The oaskys Mattress Cotton Top Mattress Pad has diamond quilting, which helps the filling stay in place instead of bunching up unevenly. Although this pad is made with cotton, spilled fluids can be quickly and easily cleaned up. When you need to wash the oaskys Mattress Pad, just throw it in the washing machine and dry it on low heat to prevent shrinking. This pad comes with a lifetime guarantee that allows you to replace it or get a refund, no questions asked. The Bedsure Mattress Pad is made from a microfiber material and protects your bed from bacteria and other allergens. It feels soft and breathable, encouraging airflow, which makes it a great fit for people who tend to get hot in their sleep. If your mattress is a bit too firm for you, adding the Bedsure Mattress Pad may help it feel a little softer. This mattress pad doesn’t bunch as much as others and springs back to its original form well after washing it. This pad can be washed in the washing machine and dries quickly. Bedsure offers a one-month replacement and return service in case their customers aren’t satisfied with their purchase. If you buy their mattress pad, you’ll also get lifelong customer service. A mattress pad is a cover that you put on your mattress to provide a barrier between your mattress and sheet. With this extra layer, your mattress will be further protected against fluids and stains. Mattress pads may come with a bit of padding, but are usually fairly thin and won’t change the feel of your bed too dramatically. Mattress pads tend to be thinner than mattress protectors. They come in either quilted or non-quilted designs and can be made from synthetic or natural materials. Mattress pads typically use either an elastic stretch-over design, like a fitted sheet, or elastic straps. These products protect your bed from body oils, mucus, sweat, and other fluids, but usually won’t guard your mattress much against heavier spills. Mattress protectors are usually thicker than mattress pads and provide more of a barrier between fluids and your bed. They’re good for kids who wet the bed, adults with incontinence, and people with pets. They tend to be thicker and thus more comfortable than mattress pads. These products come with membrane backings that provide waterproofing and may, as a result, make your bed feel hotter. Preserving your mattress: A mattress pad can help preserve your mattress by adding an additional layer between germs and fluids and your mattress. As you use your mattress, spills are bound to happen and can seep deep into the bed, where you can’t reach them. Having an additional barrier will help prevent this and keep your bed fresher for longer. Protection against pests: A mattress pad can offer protection against microscopic pests, like bed bugs and dust mites, which can lead to allergies. If you find yourself waking up with itchy eyes and a runny nose, adding a mattress pad to your bed may help with your symptoms. Warding off bacteria: Mattress pads are a good way to ward off germs and bacteria. Without this additional protection, bacteria may make a home in your mattress, making it degrade faster over time. This extra barrier can help keep you healthy. If you’re currently satisfied with your mattress and the level of softness and support it gives, but want a bit of protection, a mattress pad is a good solution. People who want heavy-duty protection and a more notable comfort difference, however, might want to look into a mattress topper or protector instead. 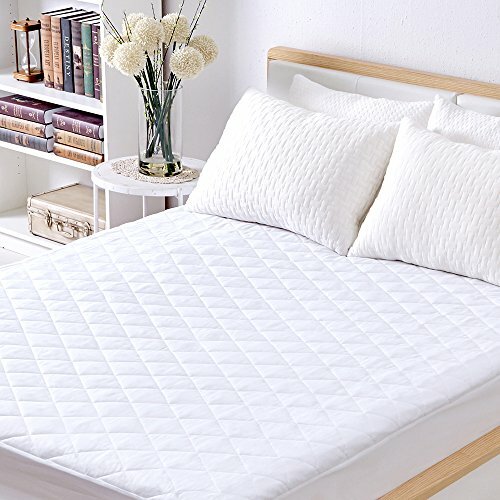 When you’re choosing a new mattress pad, you’ll soon notice that there are a few different types of materials that are common in these products. Most mattress pads are made from a combination of these materials. Let’s look at each of the most popular types below. Microfiber mattress pads, also known as synthetic down or down alternative pads, use a range of synthetic materials. Depending on the amount of fill added to the pad, microfiber mattress pads can offer a bit of softness to your bed. This material is resistant to damage from fluids and feels similar to down, but has a more affordable price tag. Memory foam is a viscoelastic material, meaning it responds slowly to pressure, conforming to your unique shape. This material is well-known for its ability to reduce pressure in the body and potentially ease pain and tension. While a memory foam mattress pad will add a bit of comfort to your bed, it won’t provide very much protection against fluids and can actually be ruined if you spill on it too often. Wool is a versatile, absorbent material that dries quickly. It’s naturally resistant to odors and has a durable structure, but it’s also quite expensive. While wool can provide some protection against fluids for your mattress, it’s not waterproof. In addition, wool can get fairly warm and should probably only be used if you live in a colder climate. Latex is a substance made from either synthetic materials, natural materials (like the rubber tree), or a blend of the two. Latex can provide some protection against fluids and stains, but it isn’t completely waterproof. 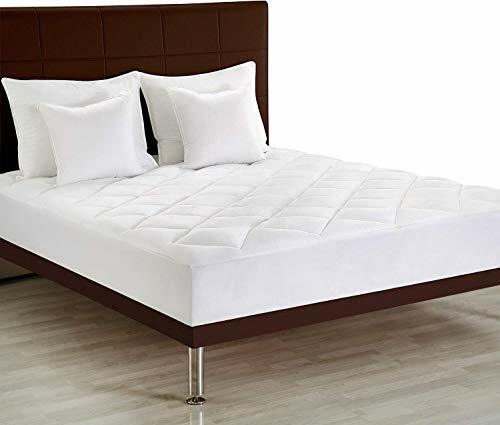 If you’re looking for a comfort upgrade for your bed, you’ll be better off with a latex mattress topper, rather than a mattress pad, as it will have more cushion. Again, a mattress pad won’t change the comfort level of your mattress too dramatically because they’re usually thin. If you want to add more plush comfort to your bed, look into a thicker mattress topper or just invest in a new mattress before adding a mattress pad. Your sleep temperature has a large impact on the quality of your sleep. A mattress pad can have some impact on your overall sleep temperature. If you struggle with sleeping hot, try to go for a breathable material, like cotton, in your mattress pad. This will help prevent you from overheating while you sleep. As with any other purchase, checking the warranty information before you invest in a new mattress pad is always a good idea. Some products may even come with a sleep trial period that allows you to test out the mattress pad before deciding if you want to keep it. Note that misusing the product by causing excessive damage to the mattress pad may make the warranty void, so read over it carefully before you buy. What else should you keep in mind before investing in a new mattress pad? Let’s look at some frequently asked questions regarding these products. Q: How do I keep my mattress pad clean? A: In order to extend the life of your mattress pad and keep yourself safe from bacteria, it’s a good idea to wash it on a regular basis. Each product will come with its own specific care instructions, so be sure to read these over carefully before you clean it. Most mattress pads can be washed in the washing machine and tumble dried, though most shouldn’t be dried on high heat or they might shrink or stretch. It’s generally advisable to use only mild detergents on your mattress pad and avoid bleaching or ironing it. Properly caring for the product will ensure that it lasts as long as possible and doesn’t degrade too fast. Q: How do I put the mattress pad on my mattress? A: There are a number of common methods for attaching a mattress pad to your bed. Some come with anchor straps which are stitched into each corner and slide underneath the mattress. This design promotes airflow because the sides of the mattress aren’t covered, leaving room for air to circulate. Other mattress pads come with an elastic fitting like a fitted sheet, and these tend to stay in place well, although they don’t provide as much breathability. Q: Can a mattress pad revive my old mattress? A: Although they can provide a bit of extra comfort, a mattress pad can’t provide enough cushion to revive an old, worn out mattress. If you need to replace your bed, you’re better off buying an entirely new mattress or using something with more padding, like a mattress topper. Q: Will using a mattress pad make me sleep hotter? A: This depends on several factors including the material of the mattress pad and your current average sleep temperature. However, most mattress pads are too thin to contribute significantly to the temperature of your bed. If you’re concerned with getting too hot in the night, you can make sure you’re using a cool mattress (with gel infusions or similar technology) and breathable linens. Q: Will a memory foam mattress pad provide pain relief? A: Memory foam mattress pads typically don’t have very much foam in them. As a result, they may provide a bit of pressure relief and help with body pain, but they are no replacement for a quality memory foam mattress. 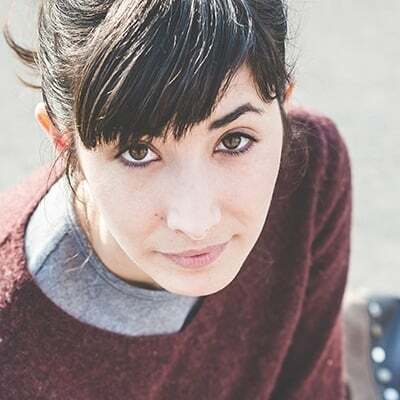 If cradling tension relief is what you’re after, you’re better off investing in either a memory foam mattress topper with a few inches of padding or a memory foam mattress. Using a mattress pad can provide your bed with some protection and shield you against bacteria and allergens, like dust mites. 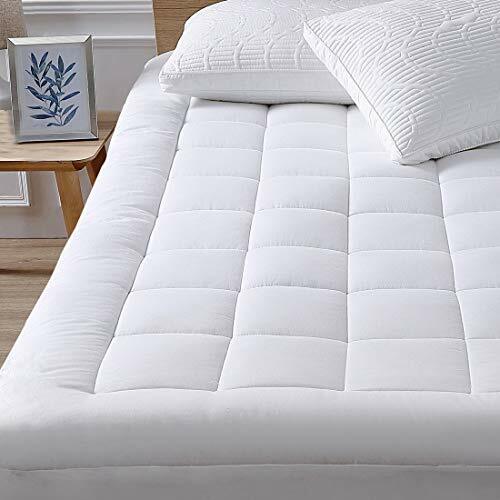 Our top pick for the best mattress pad on the market is the Tastelife Waterproof Mattress Pad because it provides the most protection against fluids and has a silent design that won’t disturb your rest.